When Emlyn Goode’s mother returns to Niagara Falls for a high school reunion, so does murder. 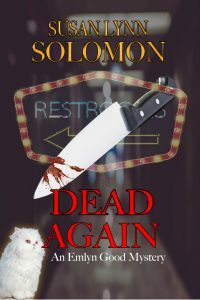 During the reunion, a woman’s body is found in the ladies room. Is this killing connected to one that occurred 40 years before in the woods below the town of Lewiston? Harry Woodward, a young police officer working his first murder case suspected Emlyn’s mother of the crime, although there wasn’t enough evidence to arrest her. Home from a year-long leave, Harry—now the Niagara Falls Chief of Detectives—together with Emlyn’s friend, Detective Roger Frey, investigates the latest killing. Distraught over indications her mother might have been involved in both murders, Emlyn, with her cohort, Rebecca Nurse, sets out to prove otherwise. But, danger lurks in the shadows when amateurs—even ones with witchy skills—get involved with murder.